In my career strategy books and seminars, I emphasize the critical importance of being able to track (or ask for) key project metrics to gauge the value of your contribution. If you want credibility with such statements as “I have a proven track record of accomplishment” then you should have some metrics to back up that statement. Quantified accomplishments always speak to hiring managers. When I worked in the oil industry as an exploration geologist, there were always plenty of project metrics available to assess the value of oil and gas drilling prospects I generated. If the exploration project was successful, then the metrics of interest would be barrels of oil or thousand cubic feet of gas per day the completed well would yield. That in turn became a line item (in bold typeface) on my résumé. When I or my team wrote B2B eCommerce proposals, it was easy to determine the value of contracts awarded to my employer; when I participated on a feasibility project team to determine the perceived cost savings to convert from print documentation to XML database publishing, the cost savings estimate was an important element of the proposal. Those quantified accomplishments became highlighted bullet list items on my résumé. If you improve a some work process by 20%, you may be able to determine the value of the time and/or costs saved (maybe with the help of the finance department). Or, an honest ballpark estimate may suffice as well as long as you disclose it it an estimate. And what exactly did this duty/task/responsibility result in? What was the bigger picture that my duties and responsibilities contributed toward? You still have to ask the question: “Do these individual items, as worded here, make me stand out from the competition with similar experience?” and you can begin to see how to differentiate yourself from others. Job Seekers: When Are You Going to See the Bigger Picture of Your Expertise? When are job seekers going to stop seeing their expertise as merely the bait for the next job? When will people start looking at how their expertise contributes to something far bigger than their own self interests? In my Career and Job Strategy Workshops, I show participants how position their expertise beyond the nose on their face. I still see far too many résumés full of bullet lists containing “duties and responsibilities” that only tell me what you did (or had a part in doing)–what I as a hiring manager what to know specifically is what was it that you accomplished in the normal performance of your “duties and responsibilities”? How did what you did contribute to the higher strategic objective of the organization? Did it generate revenue? Did it reduce costs? Did it avoid costs? Did it result in some kind of efficiency improvement? 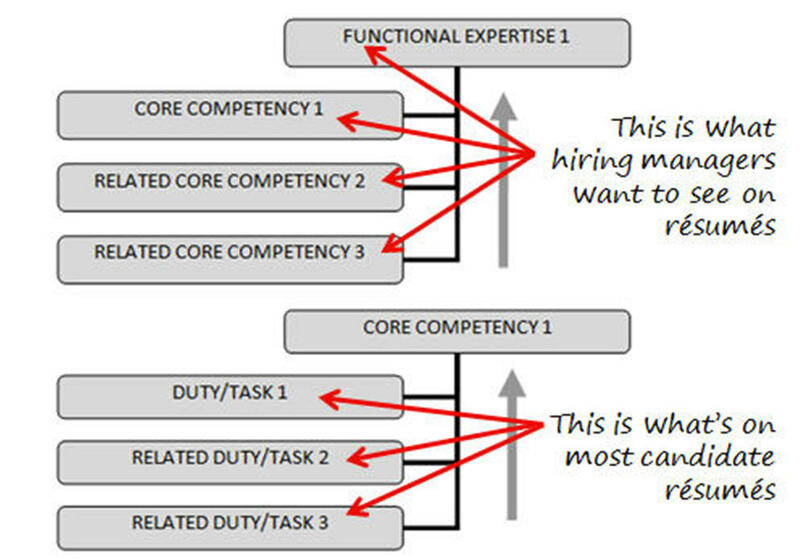 Figure 1 graphically represents how core competencies are created–by a series of related duties and responsibilities. Unfortunately, most candidate résumés are loaded with duties and responsibilities. When you have more than a few related core competencies, they contribute to a “functional expertise” and that’s what hiring managers want to see (accomplishments speak to functional expertise too). Candidates need to realize that a company is on the road to having a competitive advantage in the marketplace when they hire people who know how to showcase their core competencies and NOT just everyday duties and responsibilities. 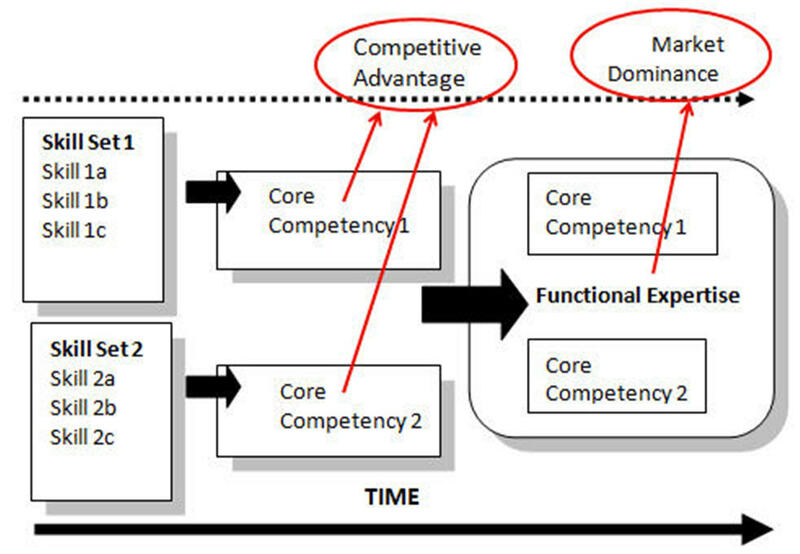 Companies that enjoy market dominance tend to employ people who know how to showcase their talent through related areas of functional expertise, as Figure 2 shows. Demonstrate to hiring managers that you understand the business, the issues, and the challenges by listing achievements/ accomplishments, core competencies, and functional expertise on your résumé–more than likely, you’ll be on that hiring manager’s short list for a job offer. Don’t Use an “Objective” Statement on Your Résumé! Please! If there’s one suggestion that bears repeating at frequent intervals to job seekers, it is this: Avoid including an Objective statement on your résumé. Please. Few things will get a hiring manager to quickly move on to the next résumé in the pile than some poorly worded, self-serving Objective statement. 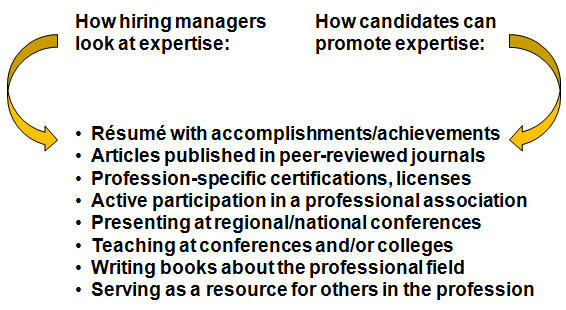 Some résumé writers and career professionals continue to suggest using Objective statements, but they are quickly recognized by hiring managers as euphemisms for “I need a job.” Forget what other authors write about creating an awe-inspiring Objectives section on your résumé—it is self-serving, states the obvious, takes up precious space on the page, and is not read by hiring managers. Your objective, as implied in your crafted cover letter, is to sell the hiring manager on how you can help that hiring manager solve problems; don’t use your résumé to talk about you and your needs. Objective (for an electrical engineering position): To obtain a challenging Test Engineering position with a dynamic high technology company. Objective (for a technical writer position): A senior-level technical communications position in a company that demands quality documentation focused on customer needs. Objective (for a criminal investigation management position): Seeking a challenging position as a Deputy Chief Investigator where I can pursue my goals and be an important asset in the organization. These Objective statements are all self-serving (“here’s what I want”) from individuals who have employee mentalities and thus fail in those critical initial few seconds to hook the hiring manager’s interest in his or her pursuit of finding a problem solver among the masses. Next post, we’ll take a look at what you should use to replace the Objective statement: The Professional Summary.